Temple Emanuel is the fifth oldest reform congregation in the United States. Founded in 1857 by five German families who had fled Europe, the congregation remained largely Germanic until the 1890s when Eastern European Jews moved into the Grand Rapids area. First known as the Benevolent and Burial Society, it occupied rented structures until 1881 when the congregation built its first home. The present Temple building, designed by San Francisco architect Eric Mendelsohn (1887-1953), was erected in 1952. This window at Temple Emanuel depicts Ruth and Boaz, central characters in the story related in the biblical Book of Ruth. Ruth, a young widow, has traveled to Bethlehem from her native country of Moab with her widowed mother-in-law Naomi. While gleaning for barley left by reapers in the field, she is seen by the landowner Boaz, who admires her devotion to Naomi and arranges for her to have enough food and drink and to gather much grain. In this scene based on verse 15 of chapter 3, Boaz pours six measures of barley into Ruth's veil. When Boaz learns that her dead husband was his kinsman, he takes Ruth as his wife. Their son Obed later became the father of Jesse and grandfather of King David. 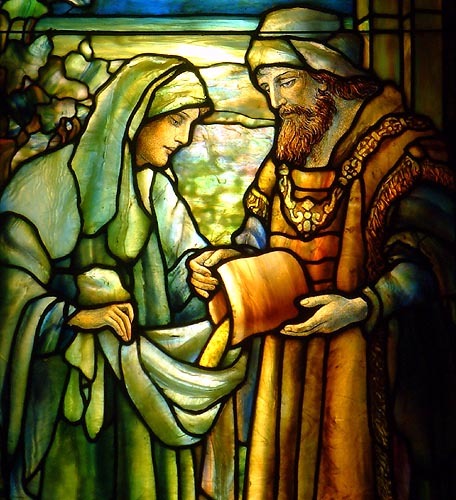 The Ruth and Boaz Window was made by the Louis C. Tiffany Studios of New York. It was given by Gustav, David and Benjamin Wolf as a memorial to their parents, Clara and Jacob Wolf and installed in the previous Temple in 1926. After the first Temple was sold in 1952, the window was removed and installed with backlighting in the foyer of the present Temple, through the efforts of Estelle Wolf, a granddaughter of Clara and Jacob. 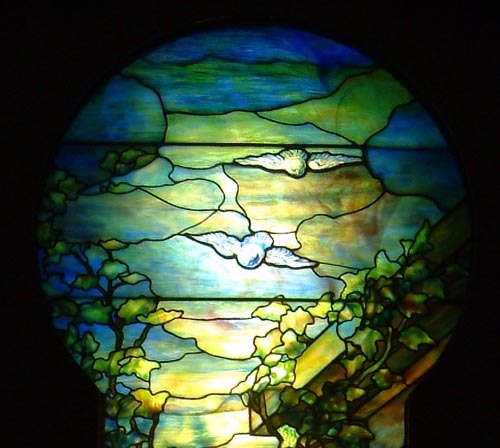 Temple Emanuel was registered in the Michigan Stained Glass Census by Barbara Robinson of Grand Rapids; photograph by Deborah P. Mankoff of Grand Rapids. Ruth, 3:15. The Holy Bible, King James Version. (New York: American Bible Society: 1999). Published May 2000 by Bartleby.com; © Copyright Bartleby.com, Inc. Text by Betty MacDowell, Michigan Stained Glass Census, February , 2005.